For the past few months I have been meaning to write about an ad that was featured in the Economist. The ad caught my eye as I sat on the porch drinking coffee with a few friends. 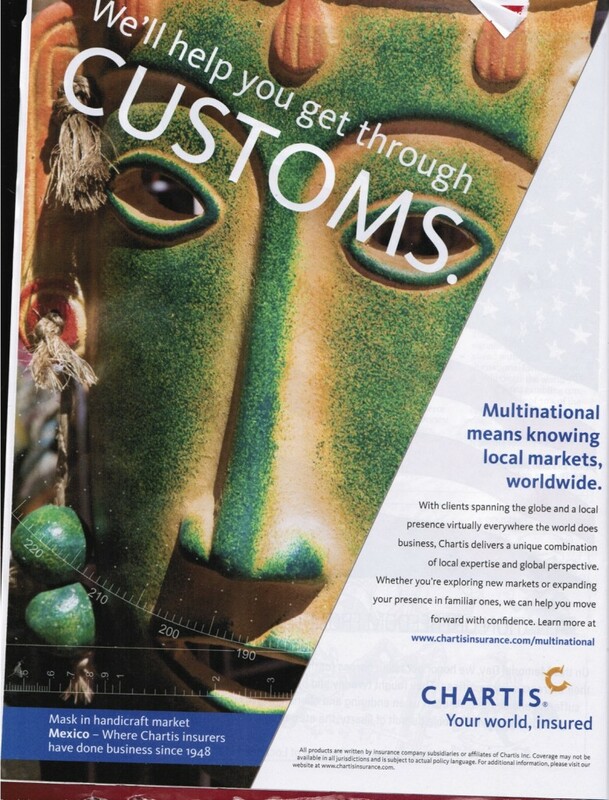 The ad, which is for a company I have never heard of called Chartis, boasts “We’ll help you get through customs” splashed across a green Mesoamerican style mask. Green like Maya jade. The outline of the ruler makes it artifacty/archaeologyish. I nearly dropped my coffee. To be fair, in super-small print, we see that the mask is “in handcraft market, Mexico”, which, I suppose, means that it is not ancient (maybe), but the message is clear. 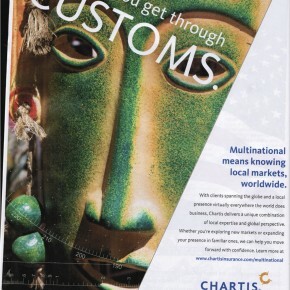 Chartis insures your tricky imports and there are only a few trickier imports than antiquities. It is hard to decide just what to say about this ad. On a very superficial level, the ad promotes the image of the elbow-to-the-ribs, “old collection”-wink, of what I hope has become a bygone era in antiquities importation. It seems to declare “rich people, have a great time collecting your baubles, we will take care of those pesky non-import regulations” or “don’t get caught with it at customs, hire our company to sort your smuggling out”. I really hope that this is not what Chartis meant by the ad…but look at it. The “we will get your illicit antiquities through customs” message is less than subtle. Even assuming the best (that Chartis never saw the “we’d be happy to smuggle for you” angle to this ad) the fact that they didn’t see anything questionable means that the “illicit antiquities=bad” message has not permeated into the marketing sector. They wouldn’t have used “We’ll help get you through customs” over an image of boxes of toy guns (or candy cigarettes, or fur coats, or diamonds from questionable parts of Africa, or, I don’t know, boxes of coca tea? ), would they? Probably not. Instant red light. I know next to nothing about marketing, but I wonder if it is a reflection of public sentiment or a driver of public sentiment. Changing the public perception of collecting is difficult. Either way, ads like these are worrying.